Come and join us and discover what Bollywood, Indian festivals and Bollywood dancing is all about. 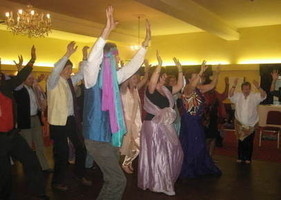 Bollywood Magic offers teaching services for all ages and abilities throughout London and the UK. We pride ourselves on providing a bespoke and professional service and our workshops and choreography are tailored for each and every client. Bollywood Dancing is a fusion of traditional and modern dancing from the Indian Film Industry. It can incorporate moves from Pop, Jazz, Bhangra, Classical and Street dance. From beautiful hand gestures, hip movements to dynamic legwork and energetic bounces, Bollywood dancing provides a fantastic workout. It is a great way to stay fit and enjoy dance at the same time. We offer Bollywood dance workshops and courses throughout London, where you can get a taster of what we have to offer. Bollywood Magic aims to reach as many people as possible, allowing people to enjoy Bollywood dancing and see what this form of dance is all about. Over 80% of our clients are based on referrals, recommendations and repeat business. Enjoy a cardio workout in a relaxed and friendly environment where everyone is welcome! Dance to the latest Bollywood and Bhangra tracks!